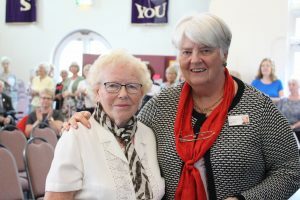 This year we incorporated our celebrations of our volunteers during National Volunteers Week (1-7 June). The Dorford Centre hosted our event on Friday 1st June, offering fantastic facilities at reduced charitable rates. The day began with an open session for potential new volunteers to drop in, meet us, and learn more about Weldmar and the sort of things they can help with. We put together various information display boards depicting our work across the charity, and we were pleased to have some really good conversations and sign up a handful of people too. We then moved on to our main event which was well supported by 150 volunteers from all areas of Weldmar, as well as three Trustees: Sue Davies, Ian Stone and Mervyn Edgecombe. Over 80 photographs depicting all areas of Weldmar, as well as a virtual tour of our inpatient unit, were played on loop on the big screen accompanied by music, for everyone to enjoy on arrival and during lunch. Many volunteers had travelled some distance, so coffee on arrival was much appreciated, and a lovely welcome to the venue. 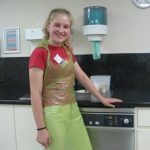 We had great feedback on the photographs as it gave volunteers an opportunity to see lots of different aspects of what we do. 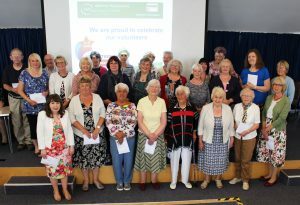 Sue Davies, Vice Chair of Weldmar Hospicecare, started proceedings by presenting 26 volunteers with their long service awards, and their contribution to Weldmar was applauded by all those in the room. A special mention goes out to Dot Hand who received the Chairman’s Award for 29 years service to the Dorchester Friends Group. Collectively, the volunteers that were recognised, have notched up 285 years service. Caroline Hamblett, CEO of Weldmar, then brought everyone up to date with developments regarding Weldmar’s aims and ambitions for the future. This was followed by questions from the floor which provided some extremely relevant and thought provoking discussion. Maurice Stradling, Chair of the Volunteers’ Group gave a brief insight into the work of the Group and how it links into Weldmar’s Volunteer Strategy. Finally, Caroline Munslow, Volunteer Services Adviser, gave a presentation to celebrate our volunteers’ highlights over the last year. To end the morning, we served lunch to all the Volunteers, which was kindly provided by Zest Catering, a new service in Dorset which donated all profits to Weldmar Hospicecare. Feedback from the volunteers during lunch was how much they enjoyed the event, and the collection bucket echoed this sentiment to the tune of £146.91. We also asked some of our Volunteers to share their stories with us, as part of Volunteers Week. 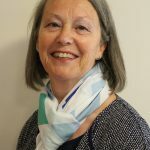 Davina Smith used to be a Trustee at a Hospice in Hertfordshire so when she moved to Dorset she contacted Weldmar, was firstly on the Council and then was appointed as a Trustee and still volunteers her time to this day. 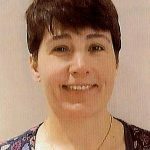 Davina is one of just eleven Trustees at Weldmar Hospicecare who all donate their time to help run this ‘Outstanding’ organisation. 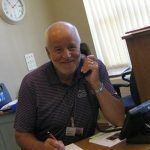 David Simpson lives in Dorchester and volunteers his time to be a receptionist at Joseph Weld Hospice in Dorchester. As a retired man, David wanted to do something worthwhile with some of his free time. 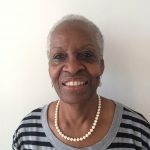 Bea Forder lives in Dorchester and has taken part in many Weldmar fundraising events in the past as well as also frequently visiting the charity shops, so when deciding to volunteer some of her time, Weldmar was the obvious choice. Veronica Antram lives in Frampton just outside of Dorchester. Veronica volunteers within the Chaplaincy Team at Weldmar, one day a week. Vivian Stone is from Tarrant Gunville near Blandford Forum and got to know Weldmar through chance after meeting with a Weldmar council member.